Inside the Concept Exploration and Analysis Laboratory (CEAL) at DST Group in Sydney. 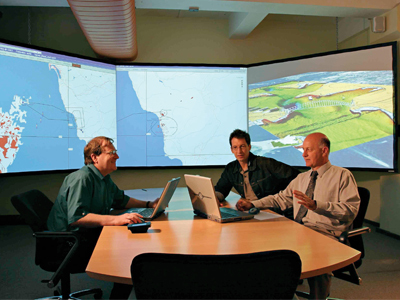 CEAL is designed for hosting collaborative activities involving DST Group analysts and military personnel to support exploration by the Royal Australian Navy of concepts for the future Navy. This work is undertaken through seminars and war games to investigate ways of using naval technology and future capabilities, such as a new type of frigate, with other forces and capabilities. The aim is to help deliver the strategic outcomes the Australian Government wants.